The following is the third message that we received in Avalon (England and Scotland) this past June/July 2012 over Solstice. You can find our other messages on our website at www.alunajoy.com under the "Articles for Personal and Planetary Transformation" link. It might be a good idea to read them in order as each message builds upon the previous one. We are sharing this message here with you just as we received it, in present time, with very little editing. We do this for a very important reason. We know that the messages that we receive are not just for our groups, but are for others as well. The Star Elders and all the others that joined us, assure me that the message and the corresponding energy will be transmitted to you as you read them. So as you read this, you might want to imagine that you are with us. Also, always view the photos on the website that we share, as photos also hold some energy of the sites. At the trail head . . .
Let's take a moment and announce ourselves as if we have knocked on the front door. We have come here out of love and respect, and a deep thirst to learn, grow, evolve and awaken - also to have instilled in us a vision of paradise . . . a family of unity. Okay, let's go. The group felt a shift of energy walking up Cadbury Castle hill and Aluna began to see things as well as we reached the top of the hill. 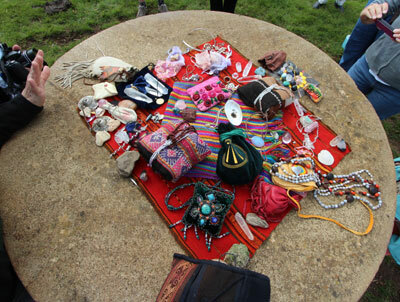 The group began to set up an altar in a circle and Aluna closed her eyes to take a peek at what was going on. What she saw was unexpected and a very big surprise. So . . . I closed my eyes for a second and saw a face very clearly - crystal clear - of a man . . . maybe 40ish with sandy brown hair, streaks of grey, and a bit of a scruffy beard. Obviously not from this era, he has a presence about him that is so powerful, yet completely understated. I am pretty sure this is King Arthur. He doesn't look like any of the pictures that I have ever seen, or renditions drawn of him. Well, this is another surprise . . . I am seeing another man draped with a shawl over his head like he has come from the Middle East. He has a grey beard. I am absolutely sure that it is Joseph of Arimathea. He has a staff and is wearing robes. Again, they are not looking as idealized as we have imagined them, but very human and very alive. I am going to ask them if they have a message for us, and you all might ask the same thing. (and those reading this) So I am seeing King Arthur and Joseph of Arimathea, whom I absolutely didn't expect to see here, nor have I ever seen by the way. I always felt attracted to Joseph of Arimathea, but he has never appeared to me. He is here for us today. King Arthur's eyes have a penetrating look, and he is looking piercingly at all of us. He is conveying what he wants to share through a frequency, or energy. The Star Elders are going to come in and help me decipher what King Arthur and Joseph of Arimathea are trying to tell me. They are not using words, but energy. Okay . . . I am going to ask the Star Elders to slow down now, because they are going too fast, and there is no way I can talk that fast. Arthur was the first one I saw; and because they are showing me everything at once, I am going to start with him. Arthur keeps looking at us with a piercing look, and his look doesn't have any vibration other than that it is a piercing look. So I asked him "Why is it just a look?" And he said, "It is a focus that we need to hold." We have to hold a strong focus within us for what we want to create and what we want to manifest in our world . . . unwavering steadfast focus. This is why he is just staring piercingly straight ahead at us. I can see the wind blowing in his hair, but no matter what we say or how we are projecting right now onto him, he is not flinching The message is that we need to focus very, very strongly on the truth within us and hold firm to that. We need to be able to hold this no matter what the outer world says or does. Okay now the Star Elders are showing me some sacred geometry. So if I don't bring that up again, remind me, because I want to share with you what else they were showing me. I guess I am going to have to flip back and forth between Arthur and Joseph of Arimathea, the way they are showing it to me. The Star Elders are not linear at all. Joseph of Arimathea has a staff, and he has it firmly planted in the ground. Again, it is the same type of message as King Arthur's. We have to keep our feet firmly on the ground - like an oak tree. Then no matter how much the wind blows, nothing will make us lose our footing. What he wants to offer us is the strength of footing - of groundedness - so no matter what winds blow, and what waves come, the ins and outs of 3D life, they won't alter or shake us, and we will not lose our focus or footing. He picked an oak because oak trees live so long. Oaks are slow growers, but they always maintain their footing. There is something about the slow growth that is significant to the group (and probably to those reading this message) about taking our spiritual path step by step. Even though we may think we are energy junkies, we have not avoided our issues and growth spurts even if they have been painful: we face them; we deal with them; we have grown from them. For Joseph of Arimathea, that is what an oak means. The oak symbolizes something that can persevere no matter what comes. No matter how much rain, storm, heat, or darkness . . . it doesn't matter. Oaks keep growing. I think this is why Joseph of Arimathea showed up for our group today, because we are like those mighty oaks. We think we are in a hurry. We have the joke that we are spiritual junkies or energy junkies, but we also know the value and the importance of facing our issues and our tests in life. We know that all the things that have happened to us in the past have gotten us to this point. And without those tests and challenges, we all recognize that we would not be here today in the consciousness level that we are at. Right? All those tests have awakened us. They have cracked us open but not stopped us from growing or losing our footing on the Earth. The third thing they were showing me is a pyramid coming up from the earth here - pointing upward. 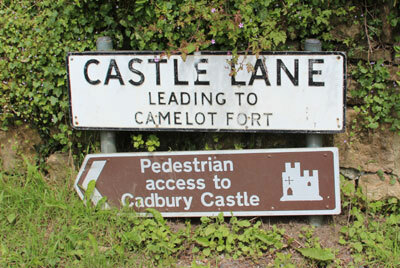 Maybe that is why there is a legend / theory that Cadbury Hill is where Arthur had his castle. There is no archeological evidence to support this theory, but maybe his castle was here energetically. Or maybe it was physically; nobody really knows. But standing here, I experience something that I don't when I'm on the Tor or other places in the countryside: there is a strong presence here of a very powerful crystalline type of pyramid shape pointing upward. There is a pyramid going the other way as well, anchoring downward. Together they make a diamond in the middle: one pointing down and one pointing up. Arthur and Joseph of Arimathea are now encircling our group and holding space for us. I think they are about to do something, but I don't know what. By the way, I am reminded that Guinevere is in the background. Coming up the path, I felt her, as well. Then I asked, "Why are the guys out in front and not the women?" Oh, this is going to sound bad. You feel it coming don't you? (laughter) Women in her age recognized their own power and didn't need or want to stand in the forefront. Sorry guys. Don't take it personally. But I have to say what I see. We know it is now the age that's harmonizing male and female energy. But women in Guinevere's time didn't need to be out in front to do their work. They didn't need to wear the costume or have the pomp and ceremony either. They knew they had the power, so they just played in the background. They were protected and kept invisible . . . but the men who knew this also knew the power of the feminine was impossible to control. Wow . . . everything is a surprise this morning. Maybe this is why I felt a little nauseous this morning. Today (solstice) we are on a flipping point; things are reversing and evolving. Their consciousness of how they (Arthur and Joseph of Arimathea) worked in their age, centuries and centuries ago, is changing now. And they are still holding onto the way it worked back in their day with the illusion of the men being in power. But neither Joseph of Arimathea nor Arthur held power like we understand power now as a negative controlling force. They held positive space. Power (in a positive sense) is what is in the process of change today. Power or authority is not necessarily reversing back to the women, but will be available to every-ONE. I think we are here to help Arthur and Joseph of Arimathea learn this, so they can let go and help support this shift. Does that make sense? Okay. So it looks like my buddies, the Star Elders, and Archangel Michael are having a chat with Joseph of Arimathea and King Arthur and explaining the time that we are in now - explaining how things are shifting and asking them if they would support us in this shifting of power. So they are having a chat, sort of like a debriefing on what's happening in 2012. I don't think anyone else has come up here and talked to them like this, so we are helping them catch up to speed. It is important because both of them are dedicated to the awakening of humanity and the unification and harmonization of humanity. 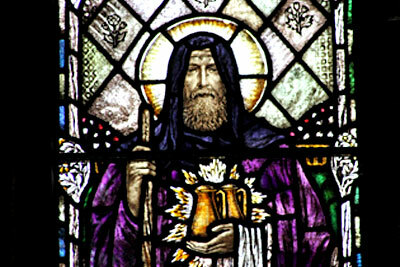 Joseph of Arimathea's role is more in regard to the awakening of humanity, and King Arthur's role is holding the space and unity. OKAY! This is exactly what Arthur and Joseph of Arimathea are going to do. They are letting go of their personality, their position, but not their power. I'm going to call it "position" because "power" is a rather negative word in our world, but they did have a position that they needed to hold. Now they realize that their old position is over; they don't have to hold that space anymore. They realize that there now will be many holding a new space. Now Joseph of Arimathea is here holding the awakening energy for humanity, and King Arthur is here on the other side of the circle. King Arthur is going to hold unity and harmony among all people no matter what race, culture or social status, religious order, age, polka dot, pink, purple, blue, short, or tall - it doesn't matter. So by us working with them, we help them evolve their position. Also, by us helping them evolve, they are helping us empower the double pyramid that is here . . . the unity and the awakening. Arthur does not have much personality left now and is fading very quickly now. He looks more like an Ascended Master now, instead of a personality or a person. He is holding an energy now, which he always had done, but now he is fully on board. Joseph of Arimathea is facing in the direction of the Middle East. Arthur came from this area at a later point in time, so there was a blending of those two eras that is so important, as well. Even though they lived centuries and centuries apart they know each other. Group Member Roar: King Arthur just said, "Welcome, you who carry my sword." Group Member Jody: Arthur's sword was a type of protection. Aluna: Yes, absolutely protection. His is a fatherly type of protection because we are his family. King Arthur viewed all people in his realm as family. His sword was not war-like. Group Member Diane: Part of King Arthur's realm was pagan and attached to the earth energy, and the other part was starting to embrace Christianity. King Arthur was very dedicated to keeping his realm unified - to being neutral and all encompassing. Group Member Debbie: I am picking up that the sword also represents truth. Aluna: Holding the sword symbolizes holding firmly to the truth. And of course, the story of Arthur and Excalibur is very old. Excalibur represented truth. The symbolism of King Arthur's sword wasn't about war - it was about truth - the truth that we are all family. Arthur's presence was fatherly. He had a very strong fatherly concern for everyone within his realm. All were considered family. All were treated as equals. Okay, I'm going to look again, because there was something King Arthur and Joseph of Arimathea were going to do now. Since they are no longer position holders, they are more like energy field holders if that makes sense to you. What I am seeing has to do with a pyramid in the center, and it looks like Arthur and Joseph of Arimathea are pouring in pure ideals with no other definition attached to them. 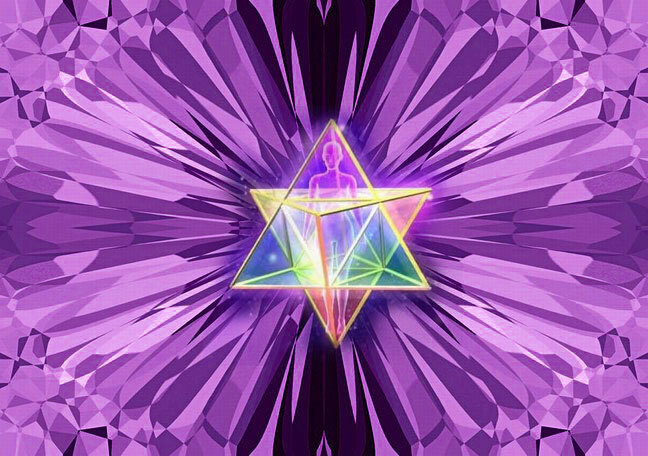 The three ideals called "awakening," "unity," and "truth" are pouring into this place with the pyramid in the center. These three ideals are continually going to build and build energy. Two pyramids joined together makes a third: the Holy Trinity. Now Archangel Michael has popped in. He is having a blast, as usual. There is a lot of Archangel Michael energy in this group, too, a lot of laughing. Archangel Michael says he is going to make sure every jet that goes over this spot gets a bolt of energy, because they (the military) use this hill as a visual point, so they fly over frequently. 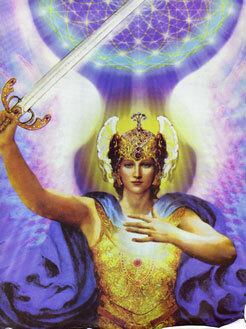 Archangel Michael just loves any kind of battle or challenge. He is going to work in waking up the military personnel flying over. The pure energy of unity, truth, and awakening is going to beam out, similar to the stained glass window we saw yesterday of Joseph of Arimathea holding the chalice with the sun behind it radiating outward. This pure, positive energy is going to radiate out like the sun behind the chalice in that stained glass window. King Arthur, Joseph of Arimathea, and Archangel Michael are including part of our pure vision with the pure energy of unity, truth, and awakening. We are starting to add in our energy, or definition of our ideals, because we are humans still. Adding our definition is not something we actually have to do - it's something that we are. It's our definition of paradise, of our sense of right and wrong, of what needs to change in this world and what's right about this world, for example. So our energy, or definition, is going to add lightly to the energy because energy needs defining at some point, at least in this dimension for a foundation to grow. For the remainder of this age, we still need to have definition. When we get to the other side, beyond this dimension, there won't be a need for such definition. There only will be the need for understanding different frequencies, since there won't be definition. But for now we still need the definition, so they are adding part of our energy to the pure energy of unity, truth, and awakening. I hope this makes sense to you. *** When vision is transformed into words, some of the message is lost unless the hearer or reader can tune into the energy. And now the Star Elders are asking that we seal up this pyramid with an amazing amount of love, joy, happiness, beauty, health, abundance, honor, respect, and all other good things. Oh, now I know why I had the dream this morning. Again, real early this morning, I had another powerful dream. Sleeping on the Michael line is proving to be really interesting. All of us - this group - were in a boat that had glass windows all around, and I'm pretty sure the boat was the boat that goes to Avalon. We saw animals, wild animals, coming toward us: one of them looked like a winged griffin, and the other one looked like a dog-type griffin. We closed up the windows as our shield of protection. Or perhaps we were inside the diamond-glass crystalline pyramid we just placed here and we are now inside. We would taunt and tease these animals because . . . does anyone understand the art of war? It's about not fighting against somebody but holding your space and letting them destroy themselves by your just holding your space. It's similar to the message of us being the oak that never wavers - same kind of thing. Anyway, in my dream we would taunt these griffin-like animals and tease them because we weren't afraid, and they would crash against the glass, hurt themselves, and go away. And then another animal came, crashed, and went away. I thought "That's weird." So I went downstairs in the boat because I said I had to do some type of research (I don't know what that was.). I asked Raphael if he could make sure all the windows were closed, because a lot of light usually attracts bugs, just like a flame attracts moths. One of the doors wasn't locked, and one of the animals got in. When this animal walked in, it turned into a human being. We all knew this wasn't a member of our group. We all knew this was a shape shifter pretending to infiltrate our group. But we just invited this "person" in. The shape shifter appeared as a woman, who knows perhaps it was the challenger to Arthur. She had dark hair, very shifty eyes, rather tall, dark curly hair - wild looking. We knew she was not one of our group, but we just said, "Hi! Welcome! Come on in." We gave her tea and cookies. We didn't let her see who we were; she got bored and left. She looked at all of us, trying to figure us out. But all of us already knew her game because we were aware. We knew she had snuck in the backdoor. So I'm wondering if in this pyramid, where we are putting our pure energy-our truth, love, unity, and awakening - when someone does find that backdoor, we allow them in. We give them tea and cookies. We make them feel at home. We let them be a part of our family, and if they stay, they are meant to. And if they leave, they are not meant to be a part of our family. Does that make sense? Group Member Barbara: Arthur said to me, "It is now time to put aside the armor. We don't need the armor anymore." Aluna: Of course, if something is blatantly coming at you, you know, you need to hold your ground like the oak. You don't let something rip you up or tear you down. But she snuck in the backdoor. She shape-shifted into something that looked like us, so we accepted her. We gave her tea and cookies, laughed and played, and she got bored because we weren't going to let her have any of our energy. But if she wanted to come join us, that would have been okay. So maybe that's our job now: to know the difference between the people we can let into our space and the ones that we know we don't want to waste our time on because they don't want to change. Jeshua just popped in. How to handle a situation like this is one of his favorite topics. Many years ago he told me a story in which he said he never, ever wasted his energy on someone whom he knew he couldn't help. Never, ever! He always chose well, because he knew he had only a short time to make a huge impact, so he picked the people that had the ears to hear and the eyes to see and the heart to feel. He never wasted his time on a hard case - if it felt like he was "beating his head against a brick wall," as we all have felt at some point in our lives. I'm sure all of us have tried to help someone, and it just didn't go anywhere. We have to have the wisdom to let go and find someone that we can help and/or be of service to. Jeshua said he never wasted his time on a lost cause. Of course, if you were raised as a Christian, you might think that's just so un-Jesus-like, un-Jeshua-like. But he said he knew his impact was going to be strong, just as all of us know when we sit quietly in our private space . . . we acknowledge how powerful we are. We know better than to waste our energy on something that isn't going to go anywhere. So they are telling us to use our energy wisely. Let the "monsters" in that we can help and keep the ones out that we know we can't help. We have the sword, or the protection and truth around us, and therefore we have the power to choose. In other words, we are in control now concerning what we let in and what we let out, and what we want to do and what we don't want to do. Group Member Lea: I noticed that there is an absence of fear in what you are describing. Aluna: Yes, in the dream, there was no fear, even though these monsters really looked scary: the dog had nasty, ugly teeth, and the griffin had big claws and a hooked beak. Yet there was nothing fearful about them at all in the dream. Group Member Lea: What you are describing now also is for us to step forth without feeling fearful because if we have fear we actually are feeding it." Aluna: Yes . . . as soon as we go into fear, the "monster," or shape-shifters, feed on it. Maybe that's why the being that snuck in the backdoor in my dream got bored: because we wouldn't go into fear and she couldn't steal our energy. When we go into fear, we lose our energy. Remember hold the focus. Aluna: So, now the Star Elders are doing what they do best. They are going to seal this diamond pyramid. It's a diamond generator placed here infused with awakening, unity, and truth. The Star Elders are going to seal it through all time, space, and dimensions; past, present, and future; body, mind and spirit; earth and sky; twenty four hours a day, seven days a week until the Earth completely wakes up, and we are unified as one family. They are thanking us and those participating while reading this message. One of the things the Star Elders were showing me is that Arthur appeared to us today because we treat each other like family. We are a family. There are no leaders, and there are no followers here. We are all here together as a family, and he recognized that when we walked up the hill. We came up as family. No one had a fancy ego. No one was dressed up like a priestess, although dressing up isn't a bad thing if you are doing it in fun. By the way, that's like Archangel Michael because he loves to dress up in all kinds of costumes. But we came here as a circle, as a family, and this is one of the reasons why they are showing us the diamond pyramid today. This is why they are allowing us to be a part of this generator for awakening unity, and we are surrounded but a fractal of this diamond pyramid generator. The Star Elders say that this pyramid is going to grow and grow and grow, and they say it is going to radiate outward. But for now it looks like approximately 30 to 40 feet up and down. (Aluna laughs) I'm not going to say that. Come on. Michael. He said that they didn't want to make it too tall because the jets would hit it. (Lots of laughter). That's Archangel Michael's sarcastic humor. He makes me say the stupidest things. Group Member Jodi: He was being kind to the pilots. So anytime when you are out in the world and you feel lost or lonely because you don't have your family around you, and you can't connect, or when you feel like you are unprotected or vulnerable, the Star Elders say to remember this spot and plug back into this energy. Does that make sense? We can come back here and feel the family and feel the center of that energy field called "awakening, unity, and truth." The Star Elders are going to put one more thing in each of these diamond fractals we go home with. If it's okay with us, they want to make this energy field of awakening, unity, and truth contagious - like light-filled, cosmic viruses. So whenever we come in contact with a like-minded soul who knows how to carry this energy as well, without ever saying a word, we will pass this energy field on, and the person will catch it. Then all of a sudden this person might feel the energy of Arthur or feel Joseph of Arimathea or feel the presence of our group. These people just might feel better and lighter and stronger - like the Oak. And then they will have the light virus, and they will pass it on and on and on. That is another way that it is going to spread across the planet. Now we need to do a big circle hug and express our gratitude to help spread this positive, creative energy. This pilgrimage began with gratitude. All of us arrived with it. We are walking gratitude every single moment. I don't think we even have to try, because this group (and those reading this) are probably the most grateful and courageous souls on earth. The first night when I landed in London, I had a download that was all about gratitude - immense, overwhelming gratitude to the point that I couldn't sleep all night. It was so loud. Gratitude, thankfulness, and that sense of feeling blessed are great ways to keep the doors inside of us open to receiving new blessings. If we don't keep the door of gratitude open, we don't receive new blessings. We have to feel grateful and thankful in order to open any new dimensional doorway that we come across. If you think that we need to give something back in some manner, it doesn't work that way with the Star Elders. We showed up, and they are grateful we are here. We are grateful we are here. The Star Elders, Archangel Michael, and any other beings of light we work with do not expect anything back from us except that we wake up and keep on waking up. It's more like a pay-it-forward. They give these gifts to us, and then we go and pay it forward. It's all up to us. We are in charge. It is our free will. We decide if we want to do the next step of paying it forward or not. And the Star Elders won't hold it against us or judge us for our choice either way. It's up to us. It always has been. The Star Elders don't have an ego, so they don't care if we thank them or make an offering to them. Only ego needs a payment or acknowledgement. We helped here today. We brought Arthur and Joseph of Arimathea up to speed into the 2012 energy. They let go of a job that was no longer needed. Now they have a more expansive role. Instead of the positions they were holding, their roles are now much, much larger. They are filling up a huge energy field, so we actually freed them. So that is a gift from us as well. Now with that said, let's send our love and blessings to King Arthur and Joseph of Arimathea. I am so glad to have met them. This was my first meeting with them, and I hope everyone got to see them, as well. It's a blessing to be in their presence. We accept their gifts, and we send them back our love, our steadfastness, and our commitment to be of service. We all know we are here out of service, and we will do our best to be of service anyway possibly when we go back out into the world. We thank the Earth for accepting this diamond energy field. We thank the sky and the sun and the stars, the moon and the planets, the universe and all the way out to universes upon universes. We thank you so much for allowing us to be here in this place and this time and, on a simple note, with good weather and full tummies. We are so blessed. We are sorry to say that spirit did not allow us to make a sacred site essence here today. It would have been a good one... but we only make them when spirit says to.